The symbol of the pineapple is universal. The pineapple fruit is seen as a symbol of hospitality and welcome and have wound their way in many forms to the home of many. 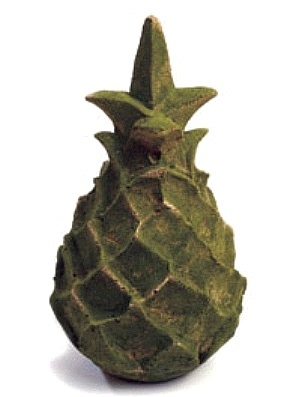 Our pineapple finial featured here is aged and perfected with moss to create a truly antique look. A nice addition for a home that is looking to create an old world look. Please noted that this pineapple finial is made of aged stone and the work involved is elaborate and created with specific conditions to enhance moss growth.